Last evening was the longest day of the year (I took this photo around 10:30 pm!) and it was also a beautiful day (the sun shone all day and the temperature was ideal!). 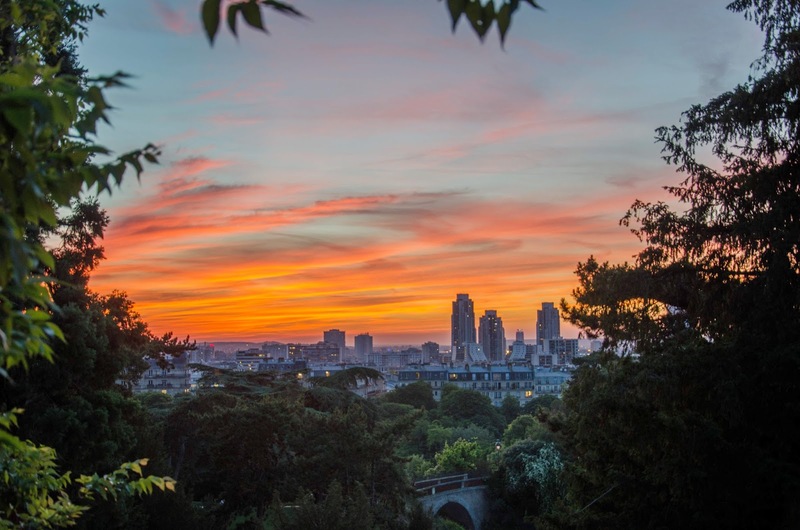 I went to Les Buttes Chaumont to see what the sunset was like and I did not regret it. I know this photo almost looks unreal (even from another galaxy!) and though I promise, I did take it last night in Paris. Today should also be a nice day and I'll be attending a barbecue with a few friends. A beautiful and magical photo, Eric! It could indeed be another galaxy. Oh la la! Wish I'd been there yesterday for the summer solstice, Fête de la Musique—and this magnificent sunset! Wow! What a wonderful sunset for me to wake up to see this morning. Thank you!! Merci everyone. Sometimes mother nature helps you! Please, Eric, don't leave us alone next year! Beautiful shot and so well framed. Spectacular shot, taken from my most favorite park in the whole world - - Merci!